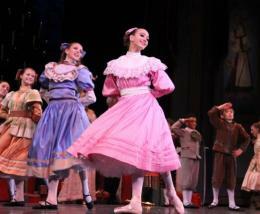 The Nutcracker- The Great Imperial Ballet is Coming Soon! Happy Monday Tampa Bay, Alex here to start your week off with some fun holiday event news. The David A. Straz, Jr. Center for the Performing Arts’ Next Generation Ballet presents The Nutcracker, The Great Imperial Ballet in Carol Morsani Hall on Friday, Dec. 16, at 8 p.m., Saturday, Dec. 17, at 8 p.m. and Sunday, Dec. 18, at 2 p.m.
From the moment the lights dim in The Nutcracker, The Great Imperial Ballet, audiences are transported to a magical place filled with marching toy soldiers, a growing Christmas tree, giant mice and crystalline waltzing snowflakes. This production features international ballet superstar Jose Manuel Carreño as the Cavalier, Miami City Ballet principal dancer Katia Carranza as the Sugarplum Fairy, Boston Ballet soloist Jeffrey Cirio as the Snow King, the award-winning dancers of Next Generation Ballet (NGB) and a cast of 150 dancers, gymnasts and even an Irish step dancer. The production is designed (sets, props and costumes) by Thom J. Peterson and choreographed by NGB artistic director Peter Stark. The production is designed (sets, props and costumes) by Thom J. Peterson and choreographed by NGB artistic director Peter Stark. Regularly priced tickets for the Friday, Dec. 16, at 8 p.m., Sat., Dec. 17, at 8 p.m. and Sunday, Dec. 18, at 2 p.m. performances of The Nutcracker start at $22.50. Purchase tickets by calling 813.229.STAR (7827) or 800.955.1045 outside Tampa Bay, in person at the Straz Center Ticket Office or online at www.strazcenter.org. Get your tickets today, you won’t want to miss out on this awesome performance. Have a great week and check back often for more information on Holiday Events and on Things To Do in Tampa Bay.